In a not-to-distant suburb, a nice, ordinary family man (John Belushi) is about to have his quiet life turned into a comic nightmare. He’s about to meet the Neighbors. 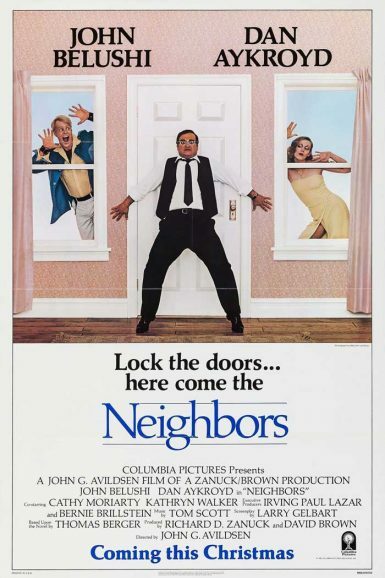 And the enthusiastic interlopers next door (Dan Aykroyd & Cathy Moriarty) will have him questioning his sanity as their relationship quickly escalates into suburban warfare over the course of one turbulent night. Belushi & Aykroyd memorably play against type in the dark comedy that would prove to be Belushi’s final film role.